Malaysians are no strangers to the wonders Bangkok has to offer. The lively city is home to world-class food, an amazing music scene and a large number of famous shopping destinations. Veteran BKK traveller Yong Mei Ling lets us in on all the must-see, must-do and must-eat spots every time she makes a trip over. Number 1 on Yong Mei Ling's 'must-do list' for any Bangkok visitor is to check out their music scene. "They (Thailand) bring in amazing artists and I was there for Coldplay and The Chainsmokers. It was great! The venues that host these events are also top notch and the people who go to these concerts are very friendly," says Mei Ling. A frequent traveller to Bangkok, Mei Ling makes a trip over once every three months for both work and leisure. As she runs a chain of Thai restaurants called Tigerlily, paying a visit to Thailand's capital gives her the chance to keep up to date with new dishes and inspiration for her own eateries, whether it be Thai street food or just to procure new goods and wares for work. Her favourite place to shop? The Emporium Bangkok. Another must from Mei Ling, ride a bike when in Bangkok, as she proclaims that it's the "best way to travel". If you haven't been to Chatuchak Market, she highly recommends to put it on your itinerary. Given its huge size and dizzying number of stores selling interesting knick-knacks, clothes and such, it would be difficult to find something that didn't catch your attention. If you ever need to refuel during your time there, Mei Ling recommends heading over to Hipster Lane in Chatuchak to get a cup of coffee and mango sticky rice. As a salsa dancer, she enjoys taking part in festivals and activities that she says are plentiful all over Bangkok. Together with her sister, the duo once took part in the Thailand International Latin Festival for a rousing round of sychronised dancing. For someone who enjoys working out, Mei Ling highly recommends a trip to Base Bangkok Gym for fun yet rigorous exercise. Classes are conducted in English and focus on combining high intensity interval training (HIIT) with strength training. "My favourite place to visit in Bangkok is Base and every trip that I make, especially when with my sister, I will try to make a stop there. It's a really nice gym and the way their class is conducted is fun, plus you feel really great after your work out," says Mei Ling. 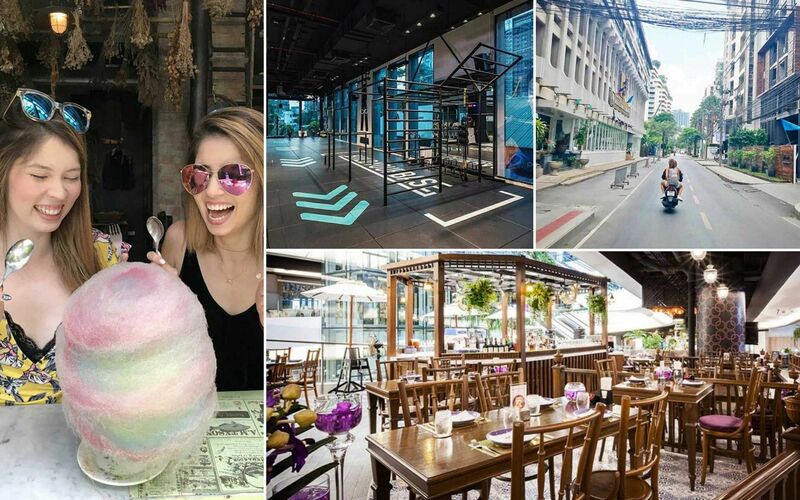 "Bangkok's fitness scene is better than KL's. They have many different gyms with workouts that we don't get here, so it's always fresh and new," she adds. When it comes to dining, one of her favourite spots to fuel up is Nara at EmQuartier. Always a must, Mei Ling orders the restaurant's tom yum soup and pad thai for a winning combo. Being a vegetarian, she notes that Bangkok restaurants are quite vegetarian friendly due to the influence of Buddhism, making it easy for her to get good green meals. A classic dessert, she highly recommends indulging in mango sticky rice at Nara during your visit. Her second favourite place to eat, Karmakamet Diner, is a charming highly-Instagrammable brunch spot that also serves up great vegetarian fare. A must try for meat-free diners, according to Mei Ling, is the vegetarian meatball spaghetti. But you'll be forgiven if you decide to go for the sweet stuff. Like this rainbow candy floss over strawberries and cream dessert that manages to put large playful smiles on Mei Ling and Mei Fong's faces.